I found these postcards while cleaning my office yesterday. Snow Squallss, often associated with strong cold fronts, are a key wintertime weather hazard. They move in and out quickly, and typically last less than an hour. The sudden white-out conditions combined with falling temperatures produces icy roads in just a few minutes. Squalls can occur where there is no large-scale winter storm in progress and might only produce minor accumulations. Snow squalls can cause localized extreme impacts to the traveling public and to commerce for brief periods of time. Unfortunately, there is a long history of deadly traffic accidents associated with snow squalls. Although snow accumulations are typically an inch or less, the added combination of gusty winds, falling temperatures and quick reductions in visibility can cause extremely dangerous conditions for motorists. It’s like a tiny blizzard, happening at a surface where freezing cold air hits warm wet air, and this seems to happen more and more. Snow squalls existed when this postcard was printed but were much less frequent and did not warrant a warning. Now they occur regularly. 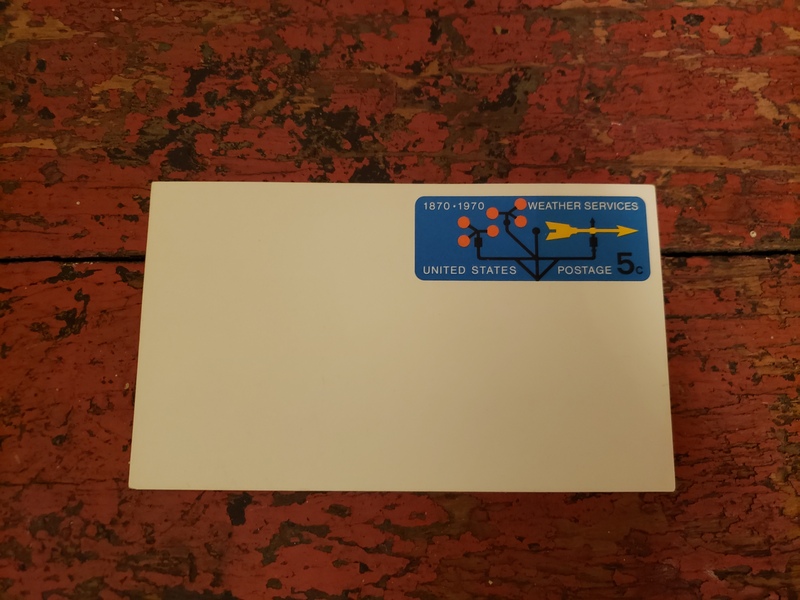 I do not know, but I believe, that when they printed this postcard, there was no such thing as thundersnow (TSSN). … (Now, 90 minutes later, I have read the Royal Meterological Society’s “Overview of Thundersnow” and see that there are citations stretching back to 1099… but it sounds like TSSN was extremely rare, and has become less rare. Observations of lightning and thunder with snowstorms have been documented since the nineteenth century in the Western Hemisphere (Herschel, 1888) and in China since 1099 (Wang and Chu, 1982). Chinese warriors believed thundersnow storms were precursors to enemy attacks (Wang and Chu, 1982). Despite this long history of observations, little is known about thundersnow, partly due to the rarity of such storms compared to non-thundering snow storms and partly due to the lack of direct observations inside the clouds producing lightning. Anyway, now there is thundersnow, and now there are snow squalls too. And I found this postcard, older than we are. You may use them or exchange them. They have $.05 of valid US postage on them. You would need to add $.30 to mail them. Or exchange the card. 2020 will be the 150th year of the National Weather Service. Maybe someone will want the card then. Leonard Cohen died a year ago. Letter to Jan Galligan about Why Pictures Now? 35 years ago this month, more than a million people took to the streets of New York to say no to the madness of nuclear weapons. Talking with Andrea Karo about her Weather Project Alexis Bhagat (LX): Yesterday you said you were looking at the sun?